We have four kids, and my office is at home. They call on me often, but I don’t always answer. Most of the time it’s not really important, so I don’t respond. It’s not me who determines what’s important. They do. If they don’t respond to my silence, it must not be important to them. But if they are persistent, they will push through my silence…and eventually I will answer them. The ball is in their court. I don’t care how small or petty the matter may be. When my 9 year old daughter comes in the office and wants me to staple her “book” together (that’s a sheet of paper folded in half about four times), I’m delighted to do it. If my 15-year old wants to tell me about his math quiz, I’m happy to hear about it. Neither of these situations are particularly important on the scale of life’s bigger needs. But these are my children – what matters to them, matters to me. They are the ones who determine whether or not something matters to me. I wonder if this works the same way with God. It seems that God will often suspend His response to our requests. It’s not because we’re not important, or because our needs our too small. And it’s not because God has capacity limits. He doesn’t. Sometimes God wants his children to really want His attention. But getting God’s attention is not cheap. Getting God’s attention sometimes takes more than a random shout. Sometimes my children call out my name repetitiously. “Daddy! Daddy!” they call from the other end of the house. Usually when I don’t answer right away, something else catches their attention and they forget they were even trying to reach me. Or maybe they call my name and then figure out whatever they needed, they can easily do themselves. But when it’s really important to them, they’ll keep calling my name and move in my direction. God takes pleasure in watching us seek Him out. He wants to know that His attention is worth going out of our way – even stepping outside the usual routine. 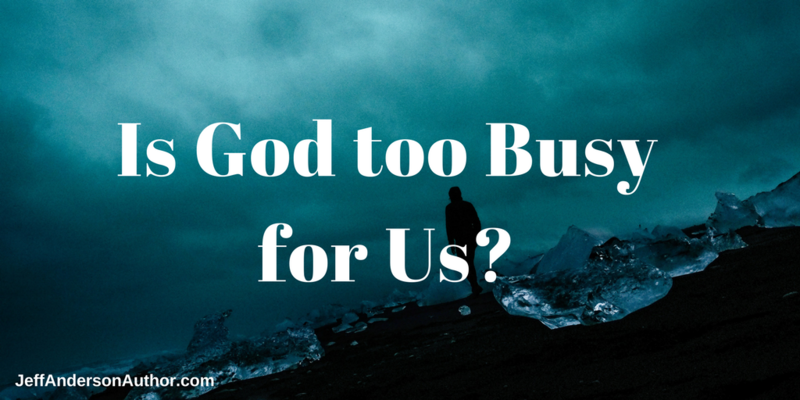 So what makes something matter to us so it matters to God? When Jesus got up early in the morning to be with God, it surely caught God’s attention. Jesus was in high demand from the people. But when he escaped the pressures of the world to be with the Father he could not see, God noticed. Getting up in the early morning hours and leaving the comfort of a bed for a seat on a chilly mountain – that’s saying something. Stepping aside from the work routine and putting yourself in position to do nothing but talk with God – has attention-grabbing power. Often I start out the day wanting to be alone with God. But in just minutes, my mind has drifted away. I’m like my child who calls out my name, but stops in kitchen to get a snack instead. I am like my child who wants me to help with something, but then gets distracted when a neighbor kid comes over to play. Daddy was on their mind – but then something more appealing came along. What they initially had in mind was just not important to them anymore. God can, and does, hear us no matter where we are. But throughout scripture we see that a meaningful focus can work in our favor. Here are some ways we show God His attention matters to us. Time – there are two times of the day when my children can most get my attention. One is early in the morning. The other is late in the evening. There’s something special about the start of a new morning, and the closing of a full day. Duration – God doesn’t have a time-quota for how long we must pray. I’ve had situations where God responded to my momentary need. But sometimes God wants us to be more fully engaged – And because we’re human, this takes time. He’s not distracted. He’s never toying with us. He’s a wonderful Father Who wants you to come to Him and catch His attention.